As the world moves faster and faster around us, companies and their employees are struggling to keep up with the pace of change. Therefore, constant learning has never been been more important than today. But first, the old adage “we learn not for school, but for life” rings hallow, as the the skills we are taught in school resemble only a small subset of what is needed to master one’s life. Second, once we have completed our education, we join a company, take on a role and become a vertical (domain) expert. Back in 1991 David Guest already proposed the T-shaped professional, where the vertical bar represents the depth of related skills and expertise within a certain domain and the horizontal bar reflects the ability to collaborate across disciplines and apply knowledge in areas of expertise that are not one’s own. Granted, that was within the context of IT professionals but should be true for probably most roles in the modern workplace. Many companies today resemble fragmented information silos. Employees in different departments work in sequence along the value chain. Each department has its own purpose, processes and even culture. Each individual becomes a master of his trade during his professional career. However, that is not good enough in today’s world. As the world becomes more complex and intertwined, companies need to adapt accordingly and create networked structures with interdisciplinary teams, promote a collaborative mindset and encourage and empower their employees to constantly learn. Hang on, are companies not already spending a fortune on trainings, development courses, external coaches, you name it? Indeed they are, and I am not going to make the point that all that is futile. I very well believe that there is a case for such trainings and coachings but it is only one side of the story (remember that vertical bar of T?!). If companies really want their employees to grow, want them to be curious and inquisitive, they need to lay the foundations for a learning mindset, especially when it comes to soft skills and mindset, since you cannot “learn“ these in a classroom or e-learning or similar. 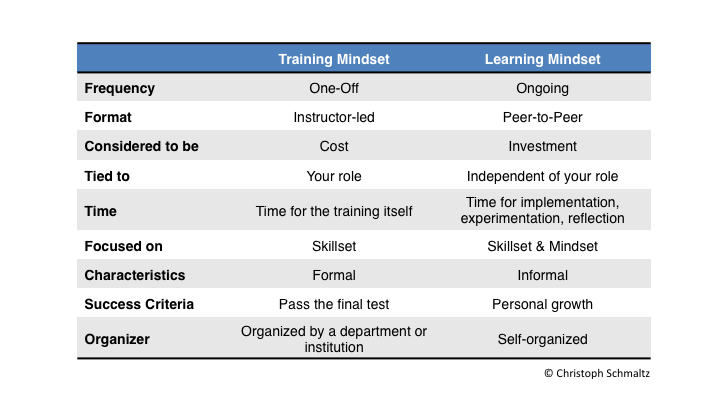 Here are some aspects that in my view define a „training mindset” and „learning mindset” within organizations. How to assess a learning mindset? Are employees that attended a training required to share what they learned with others within the organization or not? Are employees given time to apply their knowledge, experiment and most importantly reflect on the experiment (aka the learning process) or are they thrown back into their daily business once the training is over? Are employees encouraged to look left and right of their role for new things to learn or can employees only get training for things relevant to their role? Does the company openly and proactively provide the means (financial, time, space) for informal learning to happen or does it primarily offer formal training courses? Does the organization encourage employees to attend informal learning formats during working hours or only formal training sessions? I can only repeat myself: This is not a black and white story. Formal training in whatever way has its definite place within organiziations. But if this is the only focus, an organization is blind on the other eye. It shows that it has not yet fully come to appreciate the importance of a learning mindset in this VUCA world. It woefully neglects the power of self-organized, grassroot, informal learning movements and methods, and that in my view is a big mistake. In a subsequent blog post I am planning on looking at some of those informal learning methods for individuals, teams and organizations that might be helpful and relevant to you and your company.